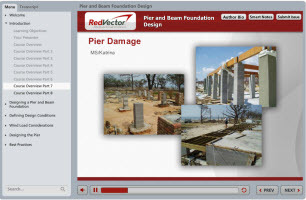 RedVector is happy to announce the launch of four new, mobile-ready eLearning courses for structural engineers. This course will present the most up-to-date ideas about designing buildings for the devastating effects of tornadoes. The focus will be on how to improve building performance and reduce damage to buildings impacted by tornadoes. The presentation will cover tornado research topics, design methods using ASCE 7-10 with needed modifications to account for tornado wind structures, and some examples on how to apply these concepts to building design. This course will provide technical information important to flood design for all types of buildings and all types of flood conditions. We will cover the minimum design and construction standards required by regulations. You will learn the current design methodologies for foundation issues for both riverine and coastal buildings. This course will cover the limitations of prescriptive solutions for flood-design problems. Flood load provisions of ASCE 7-10 Minimum Design Loads for Buildings and Other Structures and ASCE 24 Flood Resistant Design and Construction will be discussed. And you will learn how to retrofit existing buildings with flood-resistant features. As we learn more about this devastating hazard, as communities strive to be more sustainable, and as flood provisions in state and federal regulations change, it’s essential that engineers remain engaged with changing design concepts and methodologies. This course will provide technical information important in the design of pier and beam foundation systems. The design process will focus on how to apply wind and flood loads to these foundation systems using ASCE 7-10, ASCE 24, the Wood Frame Construction Manual and the International Building Codes. The use of the masonry code will also be covered. An example is included that uses elements of each of the important references. Design methods for these foundations are not covered in most structural engineering programs at the university level and have not been found in any practice journals. While the design wind loads are frequently determined for buildings, the distribution of these loads to the foundation and supporting soil and the inclusion of flood loads are important and crucial elements of the design process. 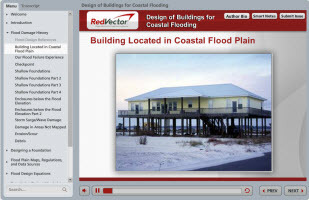 This course provides information important to the design of foundations used in coastal areas. The design methodology comes from FEMA’s Coastal Construction Manual (CCM) and has been developed from studying failures after numerous coastal storms. Flood loads are developed using both ASCE 7 and the CCM and applied to pile supported structures. Other flood effects such as erosion and scour are covered. Pile design is discussed as well as bracing methods used in pile systems. 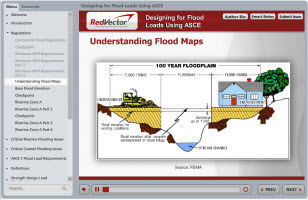 An example of how to calculate flood loads and how to apply them to the foundation at a coastal location is included to help provide context on the method and magnitude of the loads. All four courses were written and presented by William Coulbourne. Mr. Coulbourne has over 40 years of engineering, construction, and consulting experience with Fortune 500 companies, mid-size consulting firms, non-profits and single-person practices. He has a BS degree in Civil Engineering from Virginia Tech and a Masters in Structural Engineering from the University of Virginia. For the past 15 years, Bill has been in the business of finding solutions to structural engineering problems caused by natural hazards. He has written papers, made presentations, taught workshops, and written FEMA-funded documents on how to build better and safer structures in coastal environments. Mr. Coulbourne co-authored FEMA’s Coastal Construction Manual which has become the preeminent engineering tool for building in high wind and flood areas. He wrote FEMA 320, Building a Safe Room in Your Home, a document on how to build safe rooms in buildings to protect occupants from tornado threats. Bill is an off-campus faculty member at the University of Delaware, and teaches both Building Design for Senior Civil Engineers and Engineering for Disasters. He instructs for ASCE and for many of his clients. He participates in writing the national design standards for building design (ASCE 7 – Minimum Design Loads for Buildings and Other Structures) and for flooding (ASCE 24 – Flood Resistant Design and Construction). Bill owns Coulbourne Consulting, a structural engineering practice. If you are a structural engineer seeking live continuing education credit, you can catch Bill’s live presentations each month. 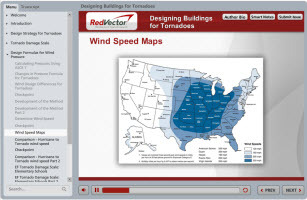 Check out RedVector’s webinars. Be sure to follow our blog and check us out on Facebook and Twitter to stay up-to-speed on all the latest eLearning news and course launches! For more information about this or other RedVector courses, contact our client support department today.